Travelers stream into the Moscow World Trade Center from the four corners of the planet: business delegations the U.S.; fashion designers from Spain; officials from China; not to mention representatives from 118 countries in 2008 for a tourism exposition. The Center is spread across a 200,000 square meter complex and its hotel is the 575-room Crowne Plaza, where Natalia Parsadanova has begun her career in the Travel & Tourism Industry. The Crowne Plaza, along with Sheraton, Hyatt, Marriott, Kempinski and a few others, is one of Moscow’s luxury international hotel brands. The world of hotels and hotel life captured Parsadanova’s imagination years ago. “When I went to a hotel I used to get a buzz like nowhere else I went,” she said. “I could have been there all day.” She enjoyed the different kinds of people, the different kinds of hotel. “I then saw that the way I could enjoy interacting with people and also get that buzz at the same time was to study travel and tourism,” said Parsadanova. She first signed up for the Travel & Tourism Program at her high school. “It gave me primary skills and knowledge of this rapidly expanding industry,” said Parsadanova. Her career track so far can be divided into four segments: (a) entry into her high school program, which introduced her to the industry; then (b) after high school entry into the Moscow Academy of Tourism and Hospitality; (c) joining the staff of the predecessor hotel to the Crowne Plaza while still a student at the Academy; (d) a year of training and supervision as manager-assistant in the Marketing and Sales Department which prepared her for working the hotel’s critical front line operation—direct customer contact. An important challenge came early in her career, in 2006, when the hotel made a major financial investment to bring the hotel up to international standards. The focus of the program was to refit the hotel physically from top to bottom, and to improve customer service. That meant not everyone would still have jobs. But the committee which evaluated Parsadanova was impressed by the skills she already had acquired, by her ability to handle her job, and by her enthusiasm for her work. She was offered the position of sales manager. She is now working in the front line, part of the public face of the hotel. 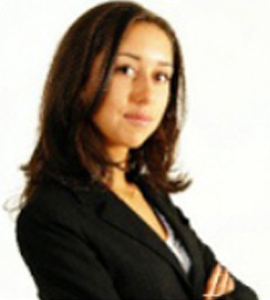 She works mostly with corporate clients, an important market for the hotel, since so many companies use the hotel. Her current role and responsibilities involve direct contact with both current and potential customers, and also customer research. Based on her research, she analyses what potential customers need from the hotel so that the hotel can offer them the right combination of products and services. When they become customers, she stays involved to make sure their needs are met. Parsadanova, now 21, never misses chances to learn more about the industry she has joined. She takes advantage of opportunities for additional training. Seminars she has attended recently include: Strategic Selling; Account Management; and Negotiation Skills. Last year her company sent her to London to the annual World Travel Market – in order to set up new partnerships for the hotel. “I want to be successful in the hotel industry, and I will do my best to make a good career,” she said. However Parsadanova is young enough and early enough in her career to know that not every young person sees the potential she saw in a career in travel and tourism, which for her has led to serious responsibility, opportunities to add to her skills, and travel. They see “long hours and low pay,” said Pasadanova, and like many others she sees that perception as a problem for the industry. To change the perception many young people have of the travel and tourism as a career, companies need “to develop internal programs to create attractive career paths” and “make industry-sponsored education programs more readily available,” she said.